Notes: Ben Young: Taylor was midway through the preparations for a fall record date; Lyons factored into the group for the record and debuted publicly with it in an October engagement at the Five Spot. ABC/Impulse! IA 9339/2, "The Dedication Series/Vol. III: The New Breed"
Notes: Ted Curson and Roswell Rudd play only #3. Notes: Primary source David Gitin who attended a concert: "I was there at the Take Three in Greenwich Village on Bleecker Street. It was a trio with Jimmy Lyons and Sonny Murray (just before they went to Europe)." 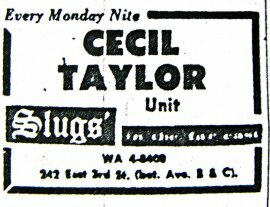 In the summer of 1962, Cecil lands a three-month, four-night-a-week gig at The Take 3, a coffee house on Bleecker Street. It's right next door to The Bitter End (Robert Levin). Notes: This was a one-week gig probably in early October. A Norweigian bass player, Erik Admudsen, was supposed to substitute on bass but he refused after he heard the music. Unknown if any recording was made. 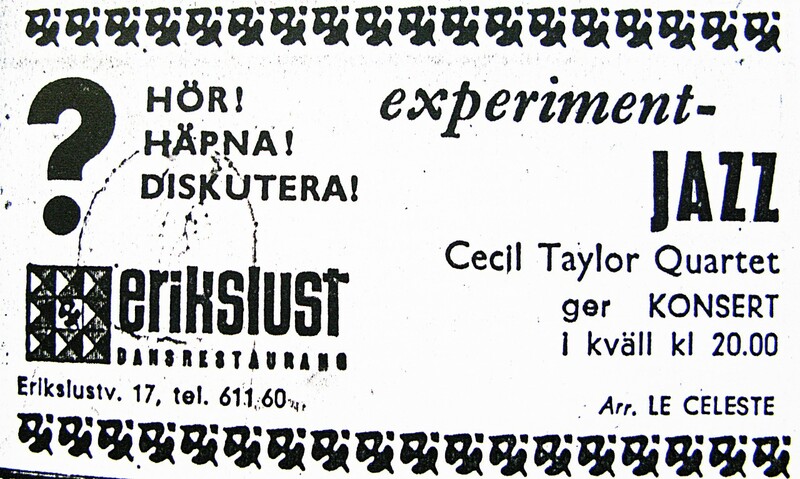 Cecil Taylor Quartet at the Golden Circle, Stockholm, Sweden, October 1962. Notes: This was a 2 weeks gig. 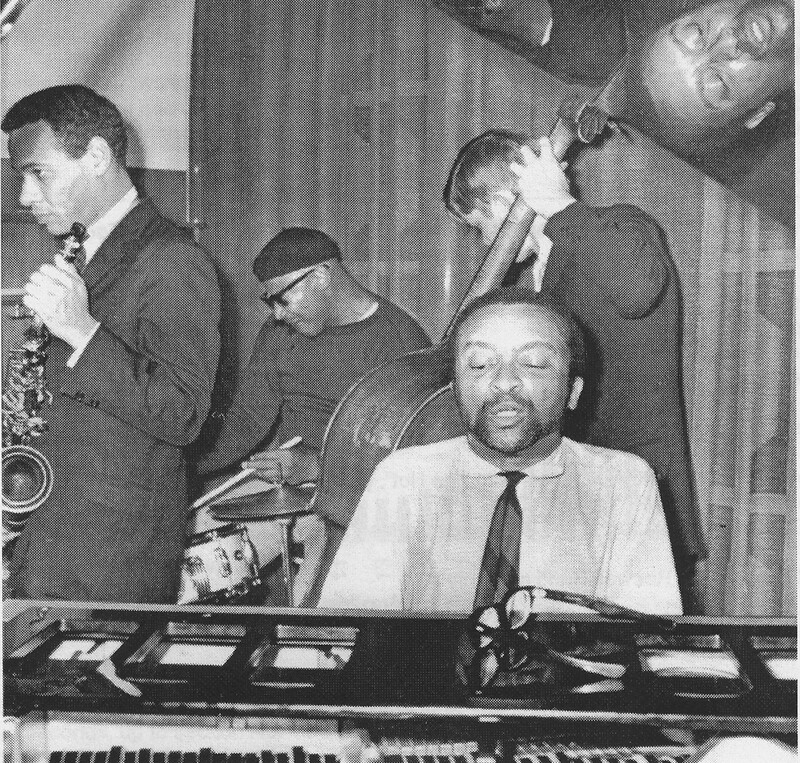 The Quartet should had included Henry Grimes on bass but Kurt Lindgren had to substitute for at least a couple of days during the two weeks. Lars Werner wrote about the performances in Orkesterjournalen (SE), November 1962. Also Estrad (SE) had an article. In circulation as a radio broadcast. Notes: The LP, # 2 – 3, is made from the TV broadcast. According to Sunny Murray, it only happened once in Stockholm that a recording session took place and as Kurt Lindgren played with the group only 2 days, it is likely that the possible radio recording took place on the same occasion as the TV recording. 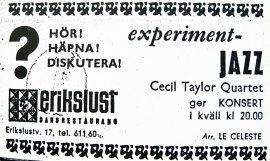 The TV broadcast is confirmed by a notice in an article from Orkesterjournalen (SE), November 1962.The TV tape was reused and is gone. The announcement is made by Bengt "Abbe" Johansson. 1 – 3 TV broadcast, tape. Notes: The concert was broadcast in Danish TV but the tape was reused due to shortage of tapes. The announcer is referring to a date of September 26, 1963 which is the date of the TV broadcast from Copenhagen. Notes: On Revenant 202, there are 2 empty tracks. 1 Albert Ayler appears with the group through the final weeks of the month including at least November 21 and 22. Notes: The gig was arranged by the club "Le Celeste". Notes: No recordings have been found. Notes: No tape has been found. 1 – 3. The concert was radio broadcast and a private tape is said to exist. According to Whitney Balliet, the New Yorker (640111), just one number was played. Close to one hour. This was a "Jazz & Folk Concert" for the benefit of Cooper Square Community Dev. Comm. Some sources call this a CORE (Congress for Racial Equality) benefit. That benefit took place around October 1963 which means that the date is wrong. 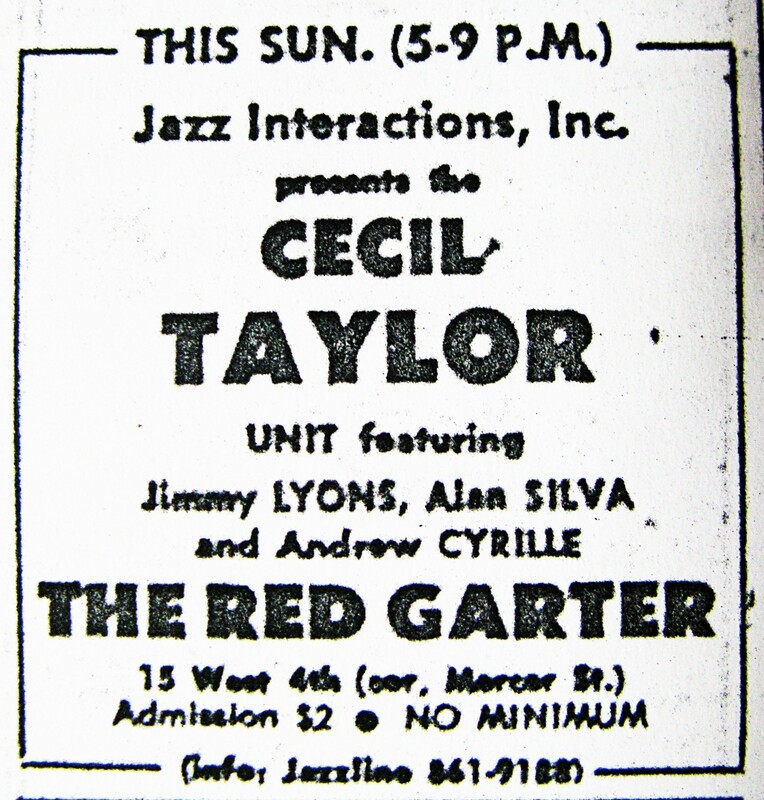 However, Cecil Taylor is not advertised for the CORE concert why the date is left. 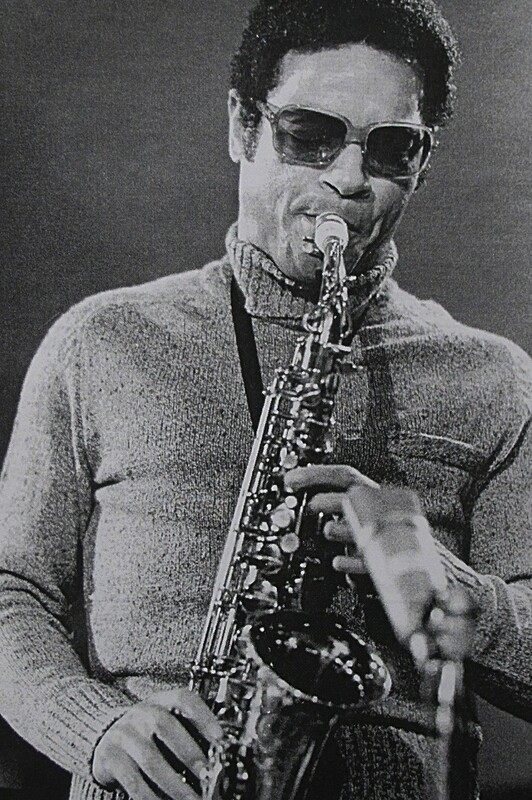 This series of events also included a performance by the Cecil Taylor Unit (at that time comprising Cecil Taylor on piano, Henry Grimes on bass, Andrew Cyrille on percussion ( reportedly his second ever date with the Unit) and Jimmy Lyons on alto saxophone. The Jazz Composers Guild presented: "4 days in December". also played the same date. Notes: # 3, Soft Shoes, is a piano solo. 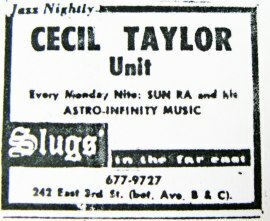 Cecil Taylor has a tape of the concert. Date 65-0307 and 17 are also given for this concert. Notes: In the advertisement for the concerts is said that there should be workshop performance on the 9th and 10th of April and a concert on the 11th. The date given on the record is the 10th. 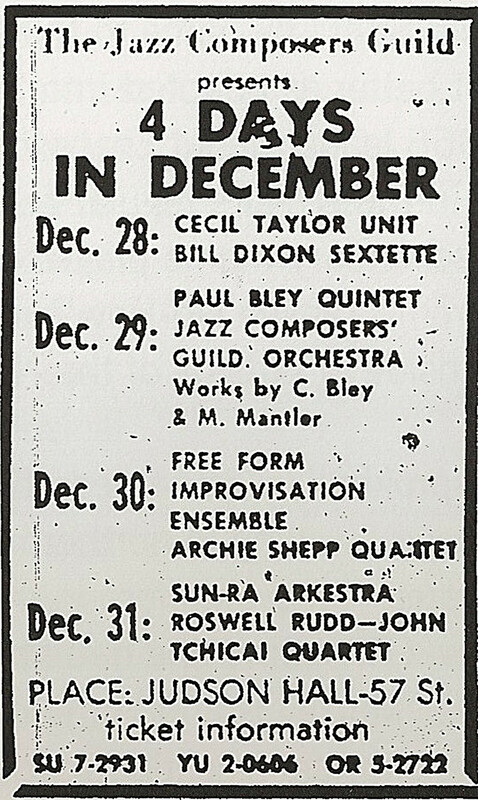 The advertisement is also listing the following musicians: Garnet Brown, "Seldom Present", Sam Rivers, John Tchicai, Tony Williams, Bob Zottola. The date 650910 and 16 are also given. Originally recorded for the radio broadcast "The Arts in America". The Ozone 19 issue is taken from a low-fi broadcast. Notes: Title #4 is shown as an example for the analyse method used. See section "Introduction, 3. Session Analyses". #3 has not been analysed. Notes: The concert was a benefit for the New York chapter of the Congress or Racial Equality and was reviewed in New York Times. 1 - 7. Radio broadcast. Notes: Cecil Taylor uses a prepared piano in #2. 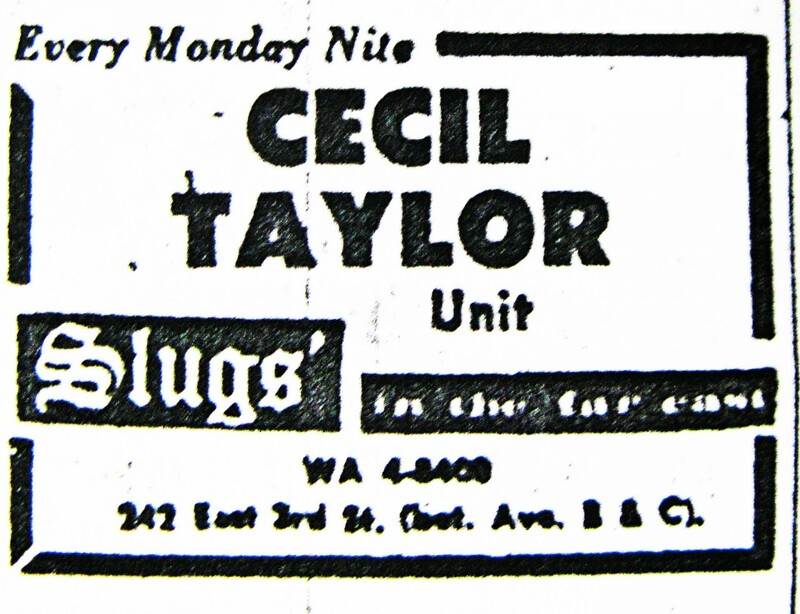 This is Cecil Taylor's first concert in Germany during "Woche der leichten Musik". The announcements are made in the radio broadcast from 1995. # 2 and # 4 are from the first concert, noon and # 6 and #7 are from the second concert, afternoon. Notes: The Unit rehearsed in the studio. Guy Kopelowicz took photos at each rehearsal. Notes: A rehearsal took place at Maison de la Radio, Paris, before the concert. The Unit rehearsed at the same location also on 661122, 24, 25, 29, 30. Notes: The date is not clear. Notes: Track 5 - 7 may come from date 66-1201. Notes: A short video is shown in the section: "Video Corner", Part 4. Recordings and interviews made for a movie: "L'Autre Cote" ("On The Other Side Of the Tracks") was produced by Luc Ferrari. # 4 used on the film "Les Grandes Repetitions" (The great rehearsals) by Luc Ferrari & Gerard Patris which is a 45 minute film which was used in the TV-series "Les Grandes Repetitions". This concerns the work of the UNIT and includes excerpts from performances (Ambitus), rehearsals and conversations. The film may also be known as "De l'autre cote du chemin de fer" – the other side of the tracks"). "Les Grandes Repetitions" (The great rehearsals). "Les Grandes Repetitions" (The great rehearsals) was a 5 – part series of TV- documentaries on the subject of Contemporary Music, specifically Edgard Varese, Olivier Messiaen, Herman Scherchen, Karlheinz Stockhausen and Cecil Taylor. Collaborators of Gerard Patris were among others Luc Ferrari and Pierre Schaeffer. The film produced and directed by Luc Ferrari and Serge G.Patris for Service de la Recherche/ORTF original is 44:45 long, televised 26.7.1968 by ORTF, a copy filed under R-67-11 at the Videotheque Nationale I.N.A., Paris (F). is said to include the 44:00 soundtrack of ORTF tv broadcast. Notes: No recording is known. This is the last concert of the French tour. Rehearsal was made on the 661209 in the same location. # 5 - # 7 in session No 66-1130 could be from this concert. Notes: The concert was announced as "Presence". Jimmy Lyons didn't play in # 2. Notes: Advertised: "Every Monday Nite". This was a one week gig. 1. Unknown title (6:16) INC.
Notes: Festival of Contemporary Art. Date also given as 68-0330. Notes: Private Recording probably exists (according to Mike Hames). 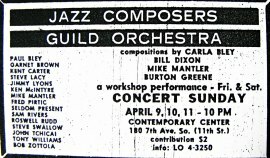 Notes: According to Alan Silva, the Festival took place in May, 1968: "In May 1968 I went on tour with Cecil Taylor to the west coast. We had a two-week residency at Stanford, played the Berkeley Jazz Festival, ..... ". Notes: The sextet did a two weeks residency. Notes: Photo from Karen Borca marked "June 1968". Locations are specified at the session numbers. Notes: The performance also included: "Lecture – Discussion"
Notes: Sets 1 and 3 are with the Quartet. 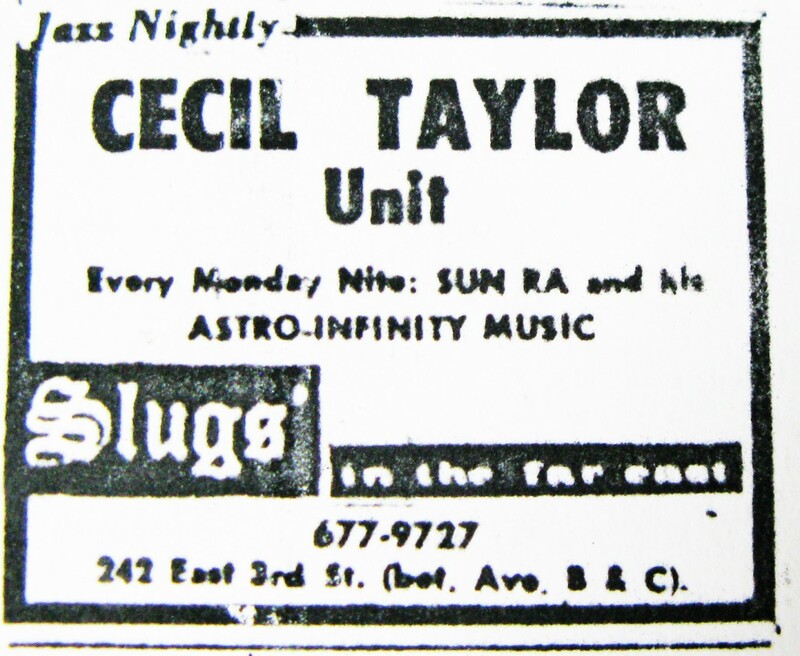 2nd set is a solo performance by Cecil Taylor. "May be a recording of a radio broadcast." The Library of Congress has two session recordings at this locale. The "1965" date on the first listed is an obvious error. The single tape listed at bottom is probably an excerpted broadcast of the 2-tapes version listed above it. (Rick Lopez). Recording Laboratory, William L. Ewell, Jr. Collection (Library of Congress). Notes: Advertised as "The Long Concert"
Location also said to be: "The Flying Circus". It is not sure that Jimmy Lyons played this concert. Notes: 4219: Eddie Gale and rhythm section only. Jimmy Lyons has solo in 4380 only. Notes: A private tape exists and it doesn't sound like the Shandar recording in session No. 69-0729. Notes: Two takes of each title were recorded. 1 – 2. Radio broadcast, tape. Notes: Title #1 is of poor sound quality and could be an audience recording. # 3 and # 4 are also placed as the LP recording from De Doelen, 69-1109. 1 – 4. BBC-TV broadcast, tape. Notes: Announcements are made by Ronnie Scott. Notes: Title 1 is announced as "Never Mind". Titles 1 – 2 are from the first concert and titles 2 – 4 are from the second concert the same day. This recording is said to come from "Newport Jazz Festival a` Paris, 1969". 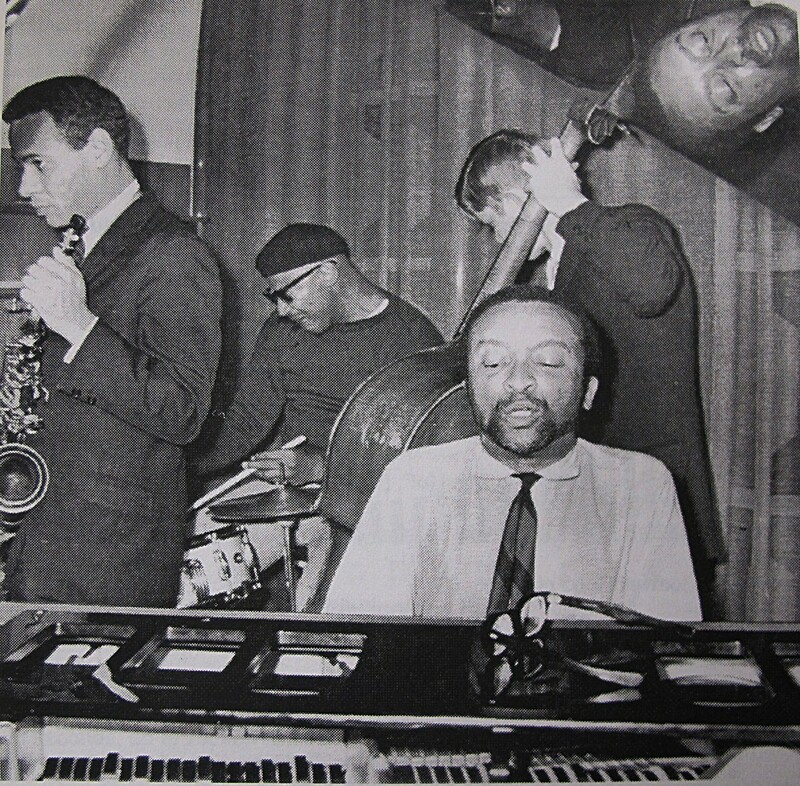 From left to right: Jimmy Lyons, Cecil Taylor, Sam Rivers. Copyright & photograph by Val Wilmer©. 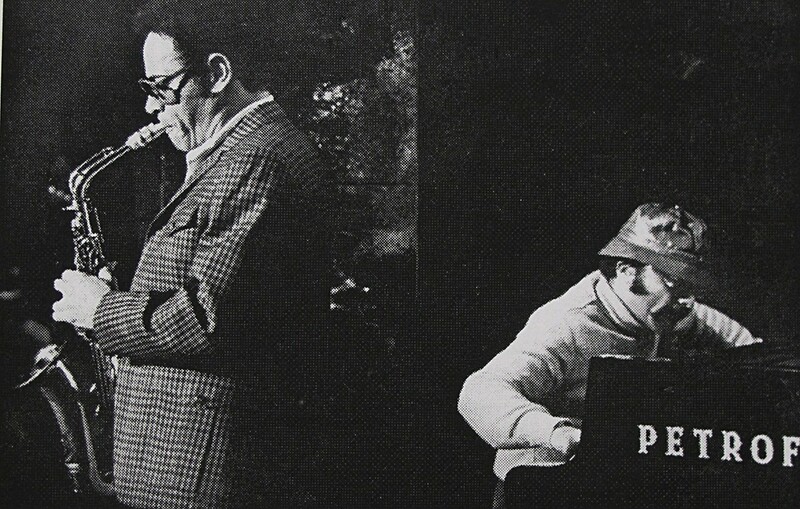 Jimmy Lyons,left and Cecil Taylor, right. Jimmy Lyons in Stockholm, Sweden, October 1969. 1 – 2 Radio broadcast by the Swedish Radio. Notes: # 2 is also titled "Unit Structure". # 3 was recorded by SR but was never broadcast. This is supposed to be the last concert on 691105. 2 – 3. Recorded from a radio broadcast June 19, 1069 on German RBB Kulturradio. Notes: About 22 minutes are missing from the first part of the concert. Notes: # 3 and # 4 are most likely from the Milano concert, 69-1026. Notes: Title # 2 was partly radio broadcast also ca 1994 and given the date 66-1016 which was wrong. Notes: The date 69-1111 is also given. Notes: Sessions produced for Columbia and RCA in the 70's by Mary Ann Driscoll. No further information are available. 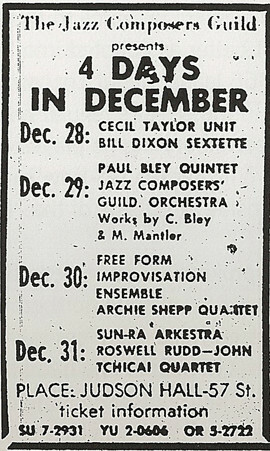 Notes: Announced as "Cecil Taylor Ensemble The Mendota Players"
Notes: Info from DOWN BEAT Vol.39 No.2 (03.02.1972), S.28, 29 (Concert review). Notes: Cecil Taylor cannot be heard in some segments. A WKCR-FM broadcast took place on a Jimmy Lyons Memorial Day, May 27,1996, with excerpts from the concert. 1 – 6 Ayler Records, aylCD036, "The Box Set". Notes: The group played 4 nights, September 14 – 17 and the recording date is unsure. Notes: A recording is known. Notes: 25 musicians presumably including Jimmy Lyons and Andrew Cyrille. A double LP was intended to issue by Unit Core but was not released. Tapes of a rehearsal were also made. Notes: The issue of Indent II was planned but no copies were issued. 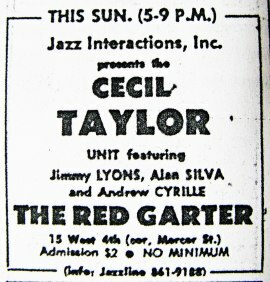 It has been suggested that Indent II was recorded as the first set and that Jimmy Lyons and Andrew Cyrille did not play. Unite Core, 3055-5B (LP) is probably from this concert. Both sides have the track title: "Indent 2nd Part" and is a piano solo by Cecil Taylor. Notes: Announcement by Masahiko Yuh. 1 – 2. Studio recordings without any audience. Lino Hall is also mentioned. Notes: This is probably not Cecil Taylor Trio playing. Instead it should be Karou Abe on as and cl with Sabu Toyuzumi or Moto Takagi on drums..
On the tape is a also a solo track by Cecil Taylor (p,vo,perc) (20:42). Notes: This was a one week gig, Tuesday through Sunday, either at the very end of May or in early June. The Trio also did certain College Concerts. 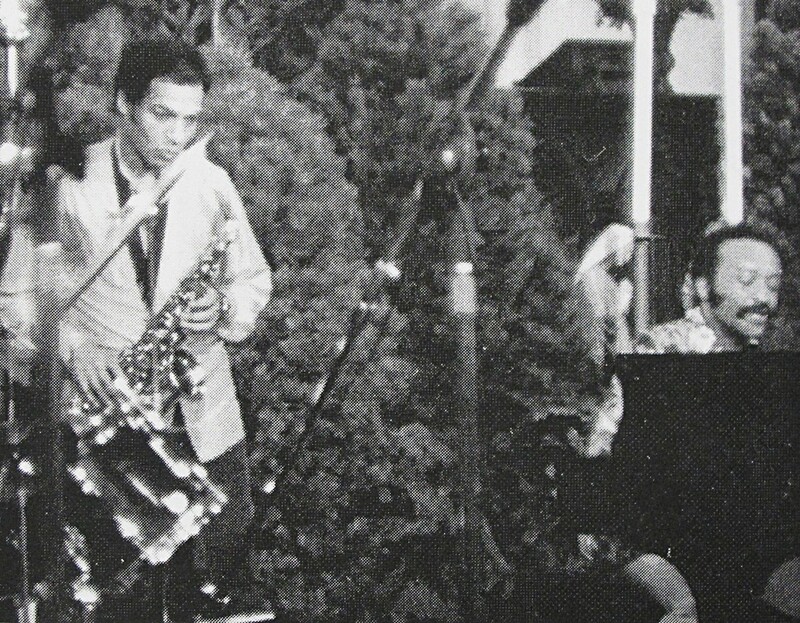 At least one performance was taped and it is possible that the Trio was included in a film of the Keystone Korner made about this time. Private Tape (audience recording) exists. 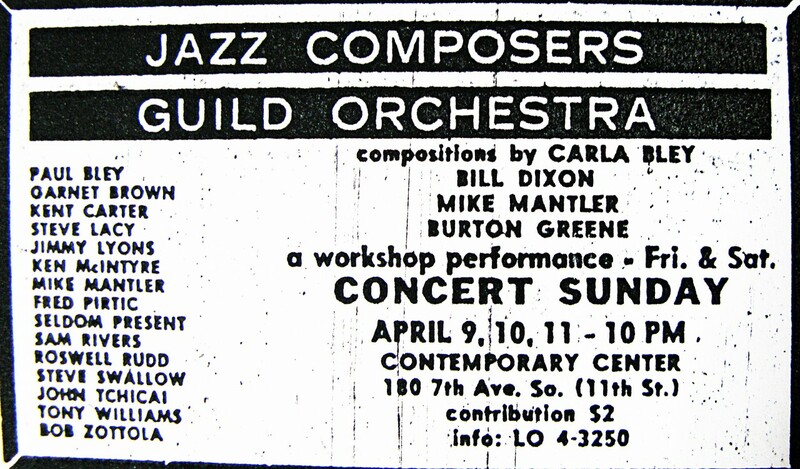 Notes: At the same concert Gil Evans Group and Chick Corea Fusion Group played. Notes: This was a five nights gig. Notes: Spring Restaurant (Formerly Cafe Musart) was located at 149 Spring Street, NYC. Cecil Taylor Quartet at The Golden Circle, Stockholm. October 1962. Photo: Jonny Gran. Copyright Pressens Bild. 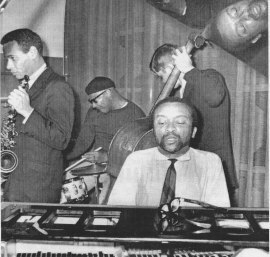 From left: Jimmy Lyons, Sunny Murray, Cecil Taylor and Kurt Lindgren. Photo: Jonny Graan, Copyright Pressens Bild. Rehearsal before BBC-TV "Jazz 625" at Ronnie Scott´s Club in London. 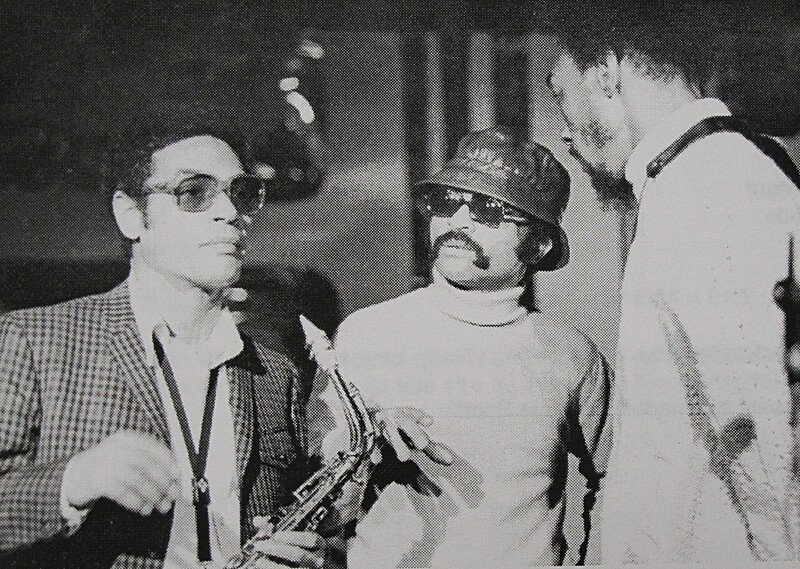 From left: Jimmy Lyons, Cecil Taylor and Sam Rivers. Copyright and photogrph by Val Wilmer. Rehearsal for BBC-TV "Jazz 625" at Ronnie Scott´s Club, London. 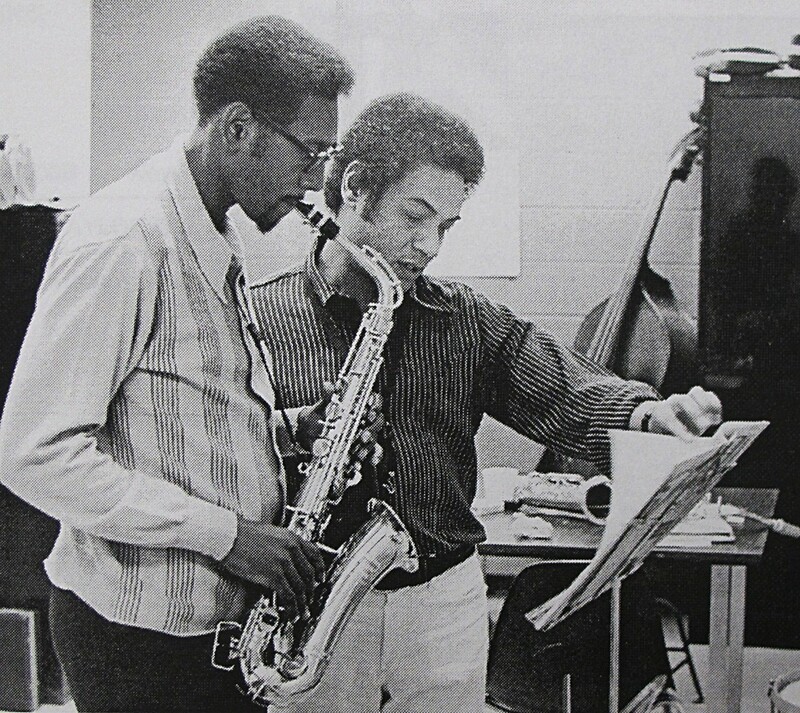 Jimmy Lyons and Cecil Taylor. Copyright and photograph by Val Wilmer. Jimmy Lyons in Stockholm, Sweden. Copyright and photograph by Arne Jönsson. Jimmy Lyons (right) teaching inmate at Narcotics Rehabilitation Project. Copyright and photograph by Hans Fallenius.